The Bird Dog: The Bird Dog is the name given to different types of hunting dogs that are used to hunt by air scent to retrieve or locate (point) to birds such as woodcock pigeons, geese, partridge, pheasant, duck, quail, or grouse. Various breeds of dogs, including retrievers, pointers, setters and spaniels, were used to locate and retrieve fowl for the early hunters who used falcons, old weapons or nets to hunt for birds and waterfowl. The history of the Bird Dogs, or Gun Dogs, began when the old hunting methods changed with the invention of firearms. In the 1770 new, faster loading firearms such as rifles and shotguns were invented and dog breeders realized that a 'Gun Dog' or 'Bird Dog' was required to locate game quickly for 'wing shooting' hunters who shot game birds, whilst they were in flight. The Bird dog needed to be quick to keep up with speed of the hunters and the Gun Dogs, or Bird Dog breeds, needed to cover broader grounds to find the scattered birds. The Bird Dog breeds are generally classified as members of the Sporting Dogs (Gun Dogs) group. Original Hunting styles of Bird Dogs: Bird Dog breeds can be divided into three main categories - Retrievers, Pointers and Setters. Many of the Bird Dog breeds were comfortable, and capable, of working in either land or water environments. The original hunting style of the 'Retriever' type of Bird Dog, that include the Spaniel breeds, was to find and return killed game to the hunter. The original hunting style of the 'Pointer' type of Bird dog was to stand rigidly still in front of their quarry directing (or pointing) the hunter to the bird or waterfowl. The original hunting style of the 'Setter' type of Bird dog was to set down, or crouch, in front of game preventing their escape from the hunter. Some spaniel breeds also fell into these original categories of Bird Dogs. Gun Dog and Bird Dog breeds: The role of the Bird dog included hunting waterfowl and game birds by retrieving game that had been shot, flushing, startling, birds from their cover and pointing to game allowing the hunter to shoot the bird. The breeds that successfully adapted to the desired role of a Bird Dog included the American Cocker Spaniel, American Water Spaniel, Boykin Spaniel, Brittany, Chesapeake Bay Retriever, Clumber Spaniel, Curly-Coated Retriever, English Cocker Spaniel, English Setter, English Springer Spaniel, Field Spaniel, Flat-Coated Retriever, German Shorthaired Pointer, German Wirehaired Pointer, Golden Retriever, Gordon Setter, Irish Setter, Irish Water Spaniel, Labrador Retriever, Nova Scotia Duck Tolling Retriever, Pointer, Spinone Italiano, Sussex Spaniel, Vizsla, Weimaraner, Welsh Springer Spaniel and the Wirehaired Pointing Griffon. Bird Dog Breeds - The American Cocker Spaniel: The medium sized, sociable, even tempered American Cocker Spaniel aka simply the Cocker Spaniel in the US, belongs to the Sporting Group and used as a Hunting Dog to flush and retrieve bird and small game. Bird Dog Breeds - The American Water Spaniel: The medium sized, eager, responsive American Water Spaniel belongs to the Sporting Group and used to flush birds, small game and waterfowl. Bird Dog Breeds - The Boykin Spaniels: The medium sized, eager, Boykin Spaniel belongs to the Sporting Group and used as a Retriever in hunts for bird types such as quail, grouse, pheasant or quail. Bird Dog Breeds - The Brittany Spaniel: The medium sized, nimble, adaptable Brittany Spaniel was used as both a Pointer, Retriever and Gundog. Bird Dog Breeds - The Clumber Spaniel: The big, faithful Clumber Spaniel belongs to the Sporting Group and used as a Bird Flusher and retriever. Bird Dog Breeds - The Cocker Spaniel (English): The medium sized, intelligent, Cocker Spaniel (English) belongs to the Sporting Group and used as a Watchdog and Hunter of bird and small game. Bird Dog Breeds - The Curly Coated Retriever: The big, lively, independent Curly Coated Retriever belongs to the Herding Group and used as a Retriever, Watchdog and Gundog. Bird Dog Breeds - The English Setter: The big, sociable, sweet-tempered English Setter belongs to the Sporting Group and used as a Bird setter and retriever. Bird Dog Breeds - The English Springer Spaniel: The medium sized, eager, sweet-tempered English Springer Spaniel belongs to the Sporting Group and used as a Bird flusher, retriever and Gundog. 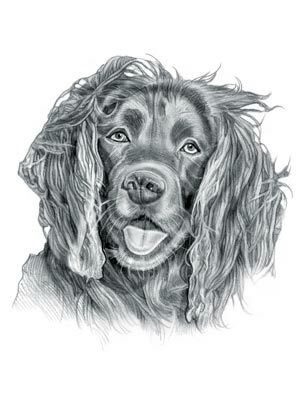 Bird Dog Breeds - The Field Spaniel: The medium sized, docile, adaptable Field Spaniel belongs to the Sporting Group and used as a Bird Flusher, retriever and Gundog. Bird Dog Breeds - German Shorthaired Pointer: The medium to large sized, lively, bold German Shorthaired Pointer belongs to the Working Dog Group and used as a Gundog and pointer for bird and small animals. Bird Dog Breeds - German Wirehaired Pointer: The medium sized, active, responsive German Wirehaired Pointer belongs to the Sporting Group and used as a Watchdog, Hunting & pointer for bird and small animals. Bird Dog Breeds - Golden Retriever: The medium to large sized, trustworthy, self-assured Golden Retriever belongs to the Sporting Dogs Group and used as a Retriever and Gun Dog for small animals. Bird Dog Breeds - The Gordon Setter: The big, eager, fearless Gordon Setter belongs to the Sporting Group and used as a Watchdog and Gun Dog. Bird Dog Breeds - The Irish Setter: The big, eager, independent Irish Setter belongs to the Sporting Group and used as a Gun Dog. Bird Dog Breeds - The Irish Water Spaniel: The medium sized, inquisitive, active Irish Water Spaniel belongs to the Sporting Group and used as a Gun Dog. Bird Dog Breeds - The Labrador Retriever: The medium sized, friendly, out-going Labrador Retriever belongs to the Sporting Group and used as a Gun and Bird Dog. Bird Dog Breeds - The Nova Scotia Duck Tolling Retriever: The medium sized, brave, eager Nova Scotia Duck Tolling Retriever belongs to the Sporting Group and used as a Water retriever. Bird Dog Breeds - The Pointer: The medium sized, active Pointer belongs to the Sporting Group and used as a Watchdog and Gun and Bird Dog. Bird Dog Breeds - The Spinone Italiano: The medium sized, patient Spinone Italiano belongs to the Sporting Group and used as a Gun Dog. Bird Dog Breeds - The Sussex Spaniel: The medium sized, sociable, calm Sussex Spaniel belongs to the Sporting Group and used as a Bird Flusher and retriever. Bird Dog Breeds - The Vizsla: The medium sized, eager, protective Vizsla belongs to the Sporting Group and used as a Gun and Bird Dog. Bird Dog Breeds - The Weimaraner: The medium to big sized, eager Weimaraner belongs to the Sporting Group and used as a Gun Dog. Bird Dog Breeds - The Welsh Springer Spaniel: The medium sized, playful, active Welsh Springer Spaniel belongs to the Sporting Group and used as a Watchdog and Gun and Bird Dog. Bird Dog Breeds - The Wirehaired Pointing Griffon: The medium sized, vigilant, faithful Wirehaired Pointing Griffon belongs to the Sporting Group and used as a Watchdog and Gun Dog.